Which characteristic do you value most in a female protagonist? As I mentioned in a previous post, author Linda Weaver Clarke says that a cozy mystery "focuses on the plot and characters, and the main character is usually an intelligent woman". Published in 2014, The Shamrock Case is the second book in the Amelia Moore Detective series, a cozy mystery series by Linda Weaver Clarke. In this new mystery, private investigator Amelia Moore is determined to solve a puzzling mystery for a new client, eighteen-year-old Kate Clemmons, who has just learned that she was adopted. Kate's birth parents were from Ireland, and died soon after coming to America. Kate wants to answer some questions about her past, and to find her biological grandparents. Amelia is eager to help Kate learn more about her ancestors, and she's excited about taking a trip to Ireland (which is on her bucket list). Like in the first book in this series, The Bali Mystery, Amelia asks her attractive friend and new partner, Rick Bonito, to help her solve the case. The Shamrock Case is an engaging cozy with twists and turns that captured and held my interest. Once again, the author has done a wonderful job with the characters and setting. Amelia is a smart, kind, and altogether admirable main character. I continue to relish the relationship between Amelia and Rick, which is purposeful, but also fun and flirty. I loved taking a virtual trip to colorful, vibrant Ireland, and could visualize the countryside, churches, inns, and famous attractions, like the Blarney Stone. Before I read this book, I was interested in visiting Ireland, which I picture as very lush and green. Now, I'm even more eager to travel to this gorgeous country, and to taste some of the delicious food featured in the book, like shepherd's pie. In back of the book there's a short list of Irish terms, such as Blathering and Dia Duit, which are used in the book, which is a charming little touch. I enjoyed this second mystery very much. The Shamrock Case is suitable for older children and adults. 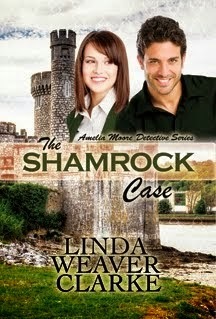 Thanks to Linda Weaver Clarke for providing me with a complimentary copy of The Shamrock Case. I look forward to reading the next book in the series, The Missing Heir, in which Amelia, Rick--and readers--will venture to Mexico. I am glad that you enjoy this author's books so much! This sounds like a series that I would enjoy as well. Great review! This is a wonderful review. Thanks, Susan. I appreciate it beyond words. Thank you, Linda. I'm enjoying your Amelia Moore Detective series a lot! Crafting a character that is an intelligent woman is super thing for an author to do. This is especially true when writing books that are intended to be somewhat light. I enjoy learning more about different genres. I haven't read too many cozies. This sound like a good one, especially since I have visited Ireland. I loved Ireland and think this would be the perfect cozy for me. Thanks for your wonderful review! This sounds like a book I'd enjoy. The Ireland aspect of the book has me interested since my mother was part Irish. I know you are a fan of this author and this sounds like a good series. I also like for female protagonists to be intelligent and gutsy as well. I have one of Linda Weaver Clarke's books on my Nook waiting to be read. Great review! Happy 4th of July! I loved this book, too, and I always enjoy Linda's books. She has a wonderful writing style. Glad you're enjoying this series. I tend to gravitate toward books about Ireland because it's one of the places I most want to visit. As always, great review! Great to have you back, I don't know how I've managed to miss your review of what sounds like a great read. I hope that one day you get to visit Ireland as I'm sure you'd love it. I guess a good female protagonist makes things awesome for me too :) Adding to my wishlist.